It occurred to me this week that, while I have shared much of my journey through formation as a Franciscan, I have shared almost nothing about my vocational story prior to the friars. Back in August of 2011, weeks before entering, I gave a little explanation as to what a friar was and what it was I would be doing over the next few years, but oddly enough, no explanation as to why. My only guess is that the earliest readers were close friends and family and so I saw no need to share what they already knew. So, who was I way back when and what happened in my life to cause me to make such a ridiculous decision? Let’s start with a little background. I was born into a Catholic family, baptized as an infant, and made to go to church and religious education until I was confirmed in 8th grade. I was always a good kid (no comments from family members please…), said prayers before bed each night, and genuinely believed in God my whole life. By the time I was confirmed, I found church tremendously boring. “Why do I need to go to church? Can’t I just read the Bible, say my prayers, and be a good person?” According to my parents, this was not enough. To church I went. Every week. This was a retreat designed specifically for the older leaders. There were still about 40 students. Few memories are happier than with these people! At that point, I really liked the prospect of becoming a youth minister and so went to college in pursuit of a religious education. While excited about faith, until this point I had very little knowledge of what that faith actually was, and needed a stronger foundation. I got involved with the Catholic ministry group on campus right away, and while it was not what I was initially looking for (it was very small and seemed to be mostly talking, whereas I was used to 100+ people singing, acting, praising, and working), I was encouraged to stick with it and grow in my faith. I was elected retreat coordinator my sophomore year, and Program Director (retreat coordinator combined with Wednesday meeting planner) the final two years. It was here that my faith evolved from the charismatic, evangelical faith I adopted in high school, to a faith grounded in theology and social teaching. I’ll never forget when it just clicked. Catholic Campus ministry did a series on social issues my sophomore year: what does the Church have to say about Walmart, poverty in foreign countries, and injustice in the business/political world? To my surprise at the time, a lot. I realized that faith was not simply praise and worship, it didn’t only take place within the church walls; faith was something that was intrinsically linked to justice, charity, and social action. I was sucked in. The faculty advisor of the Catholic group made a presentation about a new minor being offered in the spring, Poverty Studies, and I knew that’s where I was being led. After classes like “Faith and Ethics,” “Social Class in America,” and “Ethics of Globalization,” two of which taught by this Catholic professor, I knew that my vocational journey had taken a turn: I was called to serve the poor and work for just social systems from a position of faith. While inspired by the Franciscan chaplain at school, I found myself in yet another serious relationship, and the thought of ordination or joining religious life was nowhere on my radar. That was, until the summer I spent in the old friary. Driven by the most altruistic, mature reasons possible (I wanted to be independent from my parents and was hoping to spend a summer near my girlfriend), I accepted a research grant through the Religious Studies department and agreed to take part in a new program at the Franciscan church (which offered free room and board if I worked at the church and lived in community. Cha-ching!) I had no idea what was about to hit me. Consisting of two men and two women from my college, our community lived in a house next to the church, ate meals together, prayed the Office together, and met weekly for reflections with Fr. Pat (aka “FP” or aka another nickname which included his middle name… but I won’t mention that here…) Even today, I’m not sure if I could have handpicked a greater group of people to live with. From prayer we would go out to our ministry sites, returning to share, vent, and recharge each other for another day, ending as we started, in prayer. Not only did I grow more in faith that summer than any other time of my life, I grew in my understanding of intimacy. With these people, without my girlfriend (who ended up going home for the summer rather than staying in the area), I realized that I had everything I needed socially and emotionally. I realized that marriage was not the only way to be fulfilled, and without it, I would not end up lonely. As I learned about St. Francis that summer, the seeds were planted. At first, the idea of becoming a married deacon, taking more of an official role in the Church seemed plausible; the more I let it sit, though, the more I realized that becoming a Franciscan was a legitimate possibility. My girlfriend and I took a short break at the start of the year for me to get some perspective. We eventually got back together, but the nature of the relationship was completely different from then on out: I was now actively discerning becoming a Franciscan and our relationship had to take it one day at a time. Serving as many as 400 people a day is not possible without a community like this. The final step came the summer after my junior year of college. As a part of the Poverty Studies program, I was required to complete a ten-week internship in which I spent at least 50% of my time in direct contact with the poor. 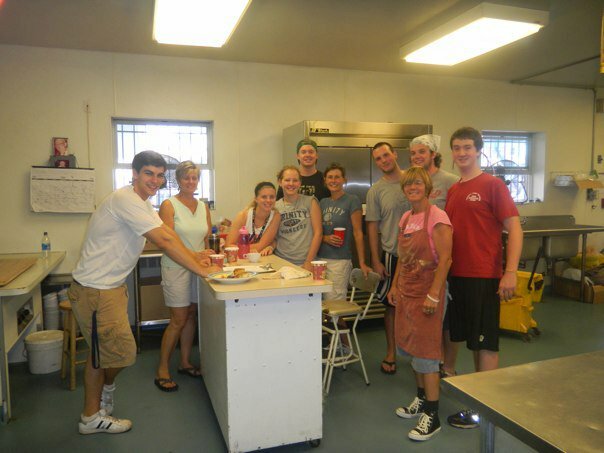 Wanting to also continue my discernment, something that was now always on my mind creating a lot of anxiety, I decided to live at St. Francis Inn in Philadelphia, our friars’ soup kitchen. It was there that I worked as the friars worked, lived as the friars lived, and prayed as the friars prayed. I experienced the vows of poverty and chastity, two vows to be expected in such a situation, but to my surprise, also the vow of obedience: sharing the house with other lay volunteers, I found myself connecting with one guy, ambivalent towards one girl, and completely agitated by another guy. Unlike my experience in community the previous summer, I had to grow in love, even will it at times, to realize the great gifts they had to offer the world, even if the way they ate really annoyed me. Talk about a preparation for friar life! When I wasn’t working, I read as much as a could about Francis and took the opportunity to get to know the actual brothers around me: besides the seven friars there at the time, I was fortunate enough to visit Wilmington, DE for a first profession ceremony, Camden, NJ, New York, and Boston, tallying seven friaries visited and more than 50 friars met in a year’s time. I came, I saw. There was nothing more I could expect to learn or see to have a more informed decision. One day in July of 2010, I found myself in the air-conditioned chapel, asleep in front of the tabernacle. I woke with this very clear thought: if I were to get married, that would mean I couldn’t become a friar. For years, it had always been the opposite. “Look what I would give up if I were celibate.” Something had changed. I realized that I had all-but decided to become a friar many months earlier, that when I said “both are great options” I was really leaning towards religious life. I was simply afraid of how my life would change once I was honest with myself. I knew I needed to say it out loud and live with the consequences of the decision already made in my heart: “I want to be a friar.” Boom. Relief. Direction. Affirmation. Since that day, I have never doubted my vocation as a friar. Is it always fun? Absolutely not! Am I ever frustrated with the friars and our Order? On a regular basis! But what marriage, job, friendship, or organization doesn’t include these things? As with anything worthwhile, this life requires a tremendous amount of work to make it happen. People often ask me how I continue to know that I’m in the right place. For me, it’s not that everything goes well or simply that there are a lot of good moments. Anyone can enjoy the good times, especially when they come easy, but that’s not a sign of vocation. It’s that I love putting in work to make it happen, that I’m still passionate about this life even through the frustrations. When you can find joy in what you do or who you’re with, even on the worst days, that’s a sign that you’re in the right place. I have my bad days for sure, but they’re bad days with people I’m called to be with. How could I even imagine being anywhere else? Great story, Friar Casey! 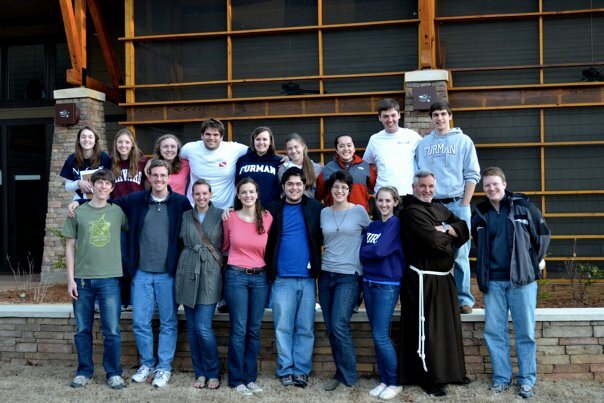 I was surprised to see a picture from your St. Mike’s Lifeteen period that included my son Pierce in it. Merry Christmas! Wonderful blog! Great comments. There is something about being at St. Anthony’s that seems to bring people closer to Jesus. Thank you for choosing this journey. You will be and already are a wonderful friar. Merry Christmas! Your journey that you have shared is inspirational, informative and candid. I appreciate that you care enough that you share your thoughts and inspirations with us. Peace and all good! Wow! What a gift your journey has been. God’s grace has been moving you in such a hidden way, but seeing all the pieces together makes God’s movement so blatantly clear in your life. Hope you’re doing great! Even on the tough days, we still get up and put on our habits and go to Chapel to pray. God’s pretty crafty at getting us to the place where we’re meant to be!